For beginners AGE 4 and up! Some youth size banjos are available for rent to get children started (depending on availablility)! A banjo can be made available for your first lesson. If you are an adult Sarah can help you find a reasonably priced beginning banjo for about $240. For general information about lessons, see Private Lessons. 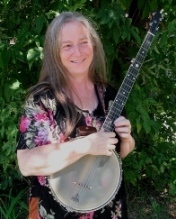 Sarah is now bringing her decades of experience teaching young children to the clawhammer banjo! Sarah teaches the beginning clawhammer banjo at Northeast Heritage Music Camp as well as at her private studio in Montpelier, VT. She uses techniques drawing primarily from her study with Ken Perlman and has added special techniques suited to very young children. While she is willing to start beginners of any age, her preference is to work with 4 - 10 year olds. She is also especially suited to helping teen and adult beginners get started on the banjo, even if they have had no prior musical training of any kind. Why start with Sarah Hotchkiss? Because her gentle and kind approach to teaching is the perfect touch for those first lessons on any instrument! Also, her experience with Ken Perlman's methods is an excellent base for any clawhammer experience to follow. Not sure if this is the right fit? Give Sarah a call and she will be happy to set you up with the best banjo teacher for your needs! Her goal is to help get more children playing the banjo, whatever that takes! For more information about banjo lessons for 4 year olds and up, or to get onto the elist for workshops and events for banjo players of all ages and levels, contact us!